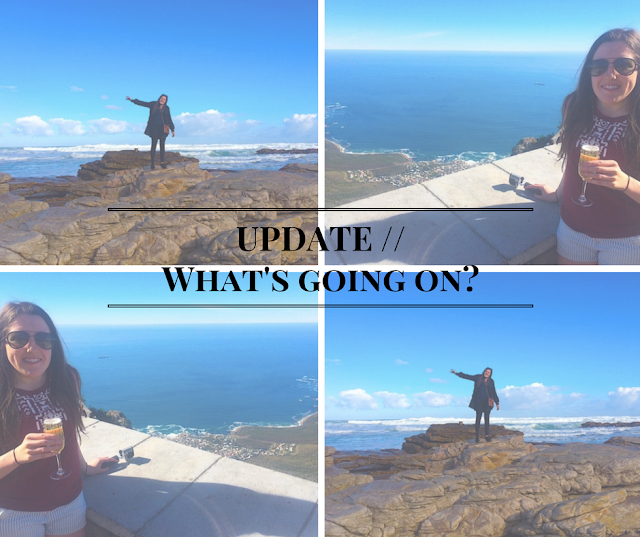 written by a girl: UPDATE | What's going on? Well, you could say it’s perhaps been a while since a new post popped up on here and it seems as though I’ve lost the hang of it a little. There’s a whole lot to catch you up on but firstly, and most obviously by the sudden influx of politics talk on Twitter for all you tweeters out there, I’m home after a year of travelling! Yep, as I sit here in my back garden, the sun trying to shine and the dog whimpering for attention at my feet, it’s safe to say I’m back and I would be lying if I said I was happy about it. Well, that’s a little harsh. It’s a really, really strange feeling coming back home after a year away. By the nineth, tenth and eleventh month, you really begin to miss the little things about home - the cup of ‘proper English’ tea, the chocolate, the Sunday roast - the mundane things that you’re yearning for after being deprived for so long. You miss family, you miss friends and it’s those things that keep you glancing at the calendar, counting how many days you have until it’s time to get on the flight home. It’s only when time is truly up, when you’re packing your belongings up on the last night, in the last hostel room, when you’re having your last drink and your last meal. It’s only when everything becomes the last that you realise you want it to be your first again, and you’d do anything to make it happen. You glance over at your travelling companion in the last Uber ride of the trip to catch your last flight and it’s then that you realise that actually, home could wait a little longer. And whilst it’s so great to see family in actual real life, to catch up with friends you’d only managed to keep in touch with through Whatsapp, to squeeze your dog so tight it actually coughs for breath a little bit as it continues to pretend like you don't exist after abandoning it for so long… It’s just, in all honesty, really hard not to cry. For the first week, each time someone asked me, ‘how was your trip?’ or ‘what was your favourite part?’, I felt like crying. Not because the questions weren’t genuine or the trip wasn’t amazing, but because, the past tense really is a killer. After so many weeks and months of telling people what we’d done so far and what we were going on to next, this time, the answers were final and the time had come to an end. For the first two weeks, I didn’t want to talk about it and actually, I couldn't really talk about it - even now I struggle to particularly find the words to describe stories or the trip as a whole because, how can you? How can you put a whole year with such different experiences and cultures and countries and people into a few sentences? So, yeah. I’ve been home for a month now and honestly, I’ve just began to find my feet again. I’m currently looking for a job in London and yes, for those that have followed my travelling trials and tribulations over the past year, that is with my travelling partner in crime and BFF, Rosie and yes, we’re living together. After a year you’d think we’d have had quite enough of each other but nope, still speaking every minute of every day seeing each other approximately 3 days a week despite our home towns being 3 hours apart. A tad unhealthy perhaps? Bless us. It’s extremely welcome for the fog to be slowly lifting on my brain and for it to be clicking into action. Hopefully now, instead of staring into the computer screen, willing a job offer just to jump up and tap me on the shoulder, I can actually start living a productive life once more. Travelling plans are in the future, as well as a few other exciting endeavours which I will spill the beans on soon but yep, here I am, finally writing on my little part of the internet again just letting you know that no, I haven't done one too many stupid things on the trip and died, I’ve just done the rather silly thing of coming back to the UK. Posts to resume as normal…starting from NOW!